A dockworker and a country lass meet by accident, both running away from the war. Together, they are going to learn to trust to one another, to work and to grow up. They will surmount at two the fear of realizing their desires and a new world will arise under their fingers, with simple pieces of paper. All without words, Papirus talks about friendship, of hope, of the fears that make us small. 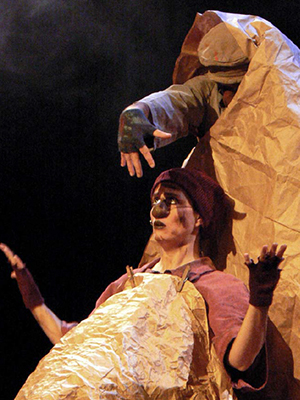 By the mime, the gesture and a creative work around the paper, the two actors make us enter to a world where poetry reigns. … And that's how a scrap of paper gave birth to a new world! "Papirus is a sample of what the shows for young audiences can propose of better: a funny and poetic fable, presented in a subtle form of entertainment." "Papirus is a show that speaks of feelings and hope. Meticulous in its detail, stimulating and ably performed with complete abandon, Papirus marks a fresh step forward for the company. It is far and away one of the most riveting shows for all ages on offer at the moment." FERRÁN BAILE - El Periódico.